It's happening, I cannot fight it off, another birthday is coming. I'm not a big birthday celebrator.. It's just not that important to me. I know we should all be excited to celebrate another year of life... but I'm kind of a Debbie Downer in that sort of sense. First off, I usually wish I has already accomplished more by the time my birthday rolls around, and in addition I hate being the center of attention. You might think that's silly seeing as how I put myself front and center here, but that's because I can hide behind a keyboard. I am pretty introverted, I've just figured out ways to hide it. With all that being said, I am trying to see the joy surrounding my birthday, and instead of dreading it, I am attempting to be grateful. I don't usually ask for anything for my birthday, I don't like to burden others with buying things for me. I even tell my husband not to get me anything. On the other hand, I can always come up with some gifts that I wouldn't mind having. 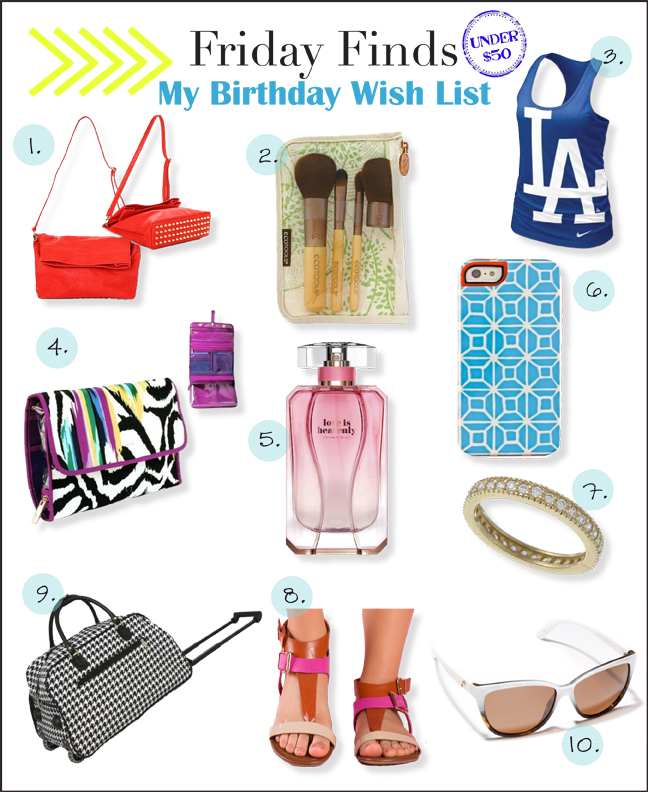 This week's Friday Finds is dedicated to all the things I would buy myself for my birthday, no obligation to others! You'll also notice my age by how practical this list is. No 21 year old would ask for a gym bag... on wheels. Gah! Break out the depends already!! Please join our OASAP giveaway and win a fab piece ! I am loving items 8 and 10! So cute!! I've been on the hunt for a new phone case. I love the one you picked out! Happy (early) birthday! those sandals and that phone case are a must have!